Whispers in the Loggia: "Man Is the Way of the Church, and Christ Is the Way of Man"
"Man Is the Way of the Church, and Christ Is the Way of Man"
Dear brothers and sisters, today our eyes behold, in the full spiritual light of the risen Christ, the beloved and revered figure of John Paul II. 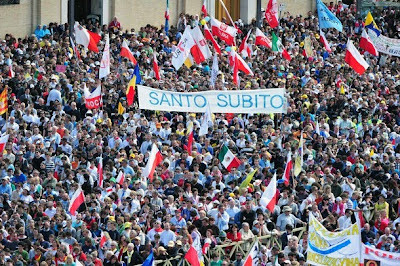 Today his name is added to the host of those whom he proclaimed saints and blesseds during the almost twenty-seven years of his pontificate, thereby forcefully emphasizing the universal vocation to the heights of the Christian life, to holiness, taught by the conciliar Constitution on the Church Lumen Gentium. 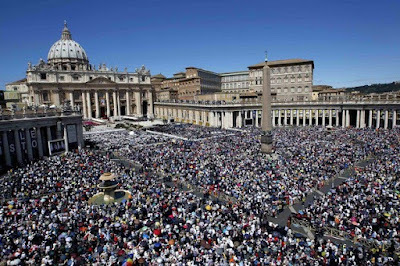 All of us, as members of the people of God – bishops, priests, deacons, laity, men and women religious – are making our pilgrim way to the heavenly homeland where the Virgin Mary has preceded us, associated as she was in a unique and perfect way to the mystery of Christ and the Church. Karol Wojtyła took part in the Second Vatican Council, first as an auxiliary Bishop and then as Archbishop of Kraków. He was fully aware that the Council’s decision to devote the last chapter of its Constitution on the Church to Mary meant that the Mother of the Redeemer is held up as an image and model of holiness for every Christian and for the entire Church. 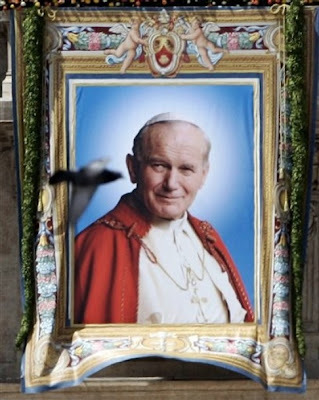 This was the theological vision which Blessed John Paul II discovered as a young man and subsequently maintained and deepened throughout his life. A vision which is expressed in the scriptural image of the crucified Christ with Mary, his Mother, at his side. This icon from the Gospel of John (19:25-27) was taken up in the episcopal and later the papal coat-of-arms of Karol Wojtyła: a golden cross with the letter "M" on the lower right and the motto "Totus tuus", drawn from the well-known words of Saint Louis Marie Grignion de Montfort in which Karol Wojtyła found a guiding light for his life: "Totus tuus ego sum et omnia mea tua sunt. Accipio te in mea omnia. Praebe mihi cor tuum, Maria – I belong entirely to you, and all that I have is yours. I take you for my all. O Mary, give me your heart" (Treatise on True Devotion to the Blessed Virgin, 266). In his Testament, the new Blessed wrote: "When, on 16 October 1978, the Conclave of Cardinals chose John Paul II, the Primate of Poland, Cardinal Stefan Wyszyński, said to me: ‘The task of the new Pope will be to lead the Church into the Third Millennium’". 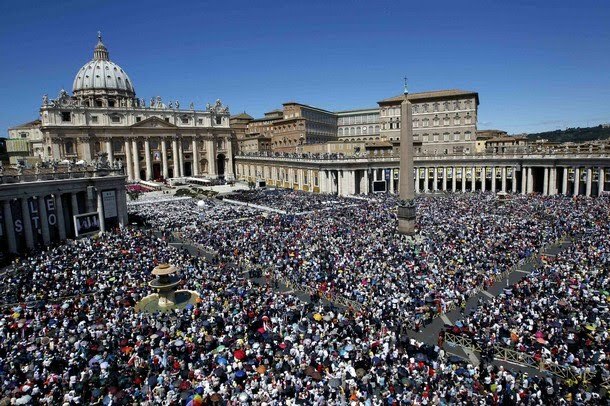 And the Pope added: "I would like once again to express my gratitude to the Holy Spirit for the great gift of the Second Vatican Council, to which, together with the whole Church – and especially with the whole episcopate – I feel indebted. I am convinced that it will long be granted to the new generations to draw from the treasures that this Council of the twentieth century has lavished upon us. As a Bishop who took part in the Council from the first to the last day, I desire to entrust this great patrimony to all who are and will be called in the future to put it into practice. 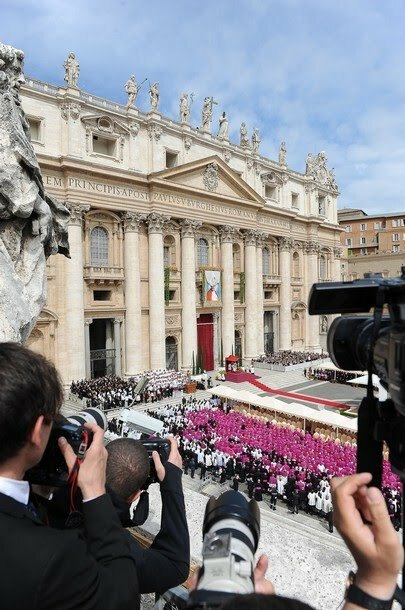 For my part, I thank the Eternal Shepherd, who has enabled me to serve this very great cause in the course of all the years of my Pontificate". And what is this "cause"? 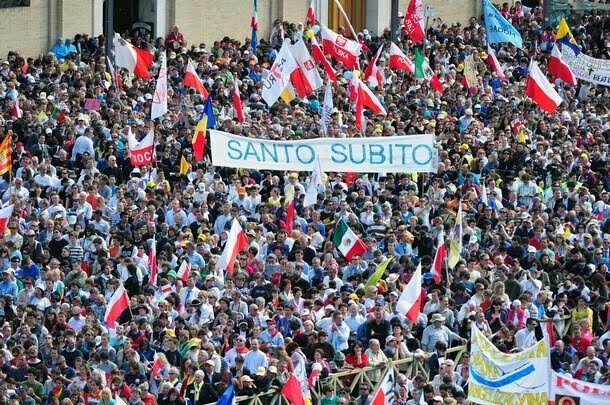 It is the same one that John Paul II presented during his first solemn Mass in Saint Peter’s Square in the unforgettable words: "Do not be afraid! Open, open wide the doors to Christ!" 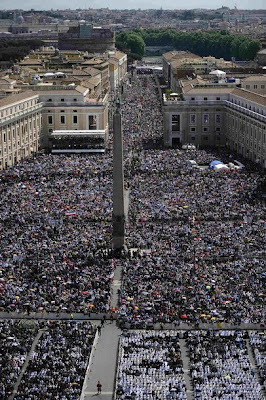 What the newly-elected Pope asked of everyone, he was himself the first to do: society, culture, political and economic systems he opened up to Christ, turning back with the strength of a titan – a strength which came to him from God – a tide which appeared irreversible. By his witness of faith, love and apostolic courage, accompanied by great human charisma, this exemplary son of Poland helped believers throughout the world not to be afraid to be called Christian, to belong to the Church, to speak of the Gospel. In a word: he helped us not to fear the truth, because truth is the guarantee of liberty. To put it even more succinctly: he gave us the strength to believe in Christ, because Christ is Redemptor hominis, the Redeemer of man. 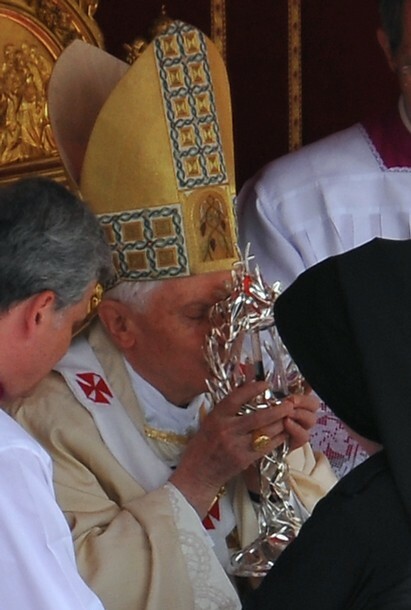 This was the theme of his first encyclical, and the thread which runs though all the others. When Karol Wojtyła ascended to the throne of Peter, he brought with him a deep understanding of the difference between Marxism and Christianity, based on their respective visions of man. This was his message: man is the way of the Church, and Christ is the way of man. With this message, which is the great legacy of the Second Vatican Council and of its "helmsman", the Servant of God Pope Paul VI, John Paul II led the People of God across the threshold of the Third Millennium, which thanks to Christ he was able to call "the threshold of hope". 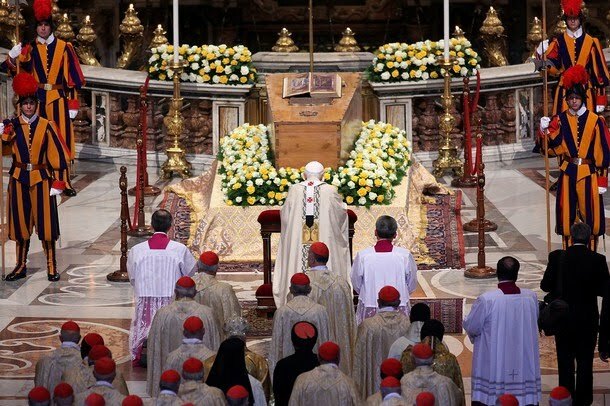 Throughout the long journey of preparation for the great Jubilee he directed Christianity once again to the future, the future of God, which transcends history while nonetheless directly affecting it. He rightly reclaimed for Christianity that impulse of hope which had in some sense faltered before Marxism and the ideology of progress. He restored to Christianity its true face as a religion of hope, to be lived in history in an "Advent" spirit, in a personal and communitarian existence directed to Christ, the fullness of humanity and the fulfillment of all our longings for justice and peace. Finally, on a more personal note, I would like to thank God for the gift of having worked for many years with Blessed Pope John Paul II. I had known him earlier and had esteemed him, but for twenty-three years, beginning in 1982 after he called me to Rome to be Prefect of the Congregation for the Doctrine of the Faith, I was at his side and came to revere him all the more. My own service was sustained by his spiritual depth and by the richness of his insights. His example of prayer continually impressed and edified me: he remained deeply united to God even amid the many demands of his ministry. Then too, there was his witness in suffering: the Lord gradually stripped him of everything, yet he remained ever a "rock", as Christ desired. 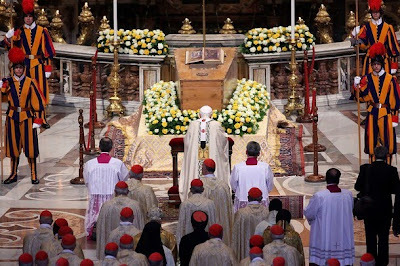 His profound humility, grounded in close union with Christ, enabled him to continue to lead the Church and to give to the world a message which became all the more eloquent as his physical strength declined. In this way he lived out in an extraordinary way the vocation of every priest and bishop to become completely one with Jesus, whom he daily receives and offers in the Eucharist.